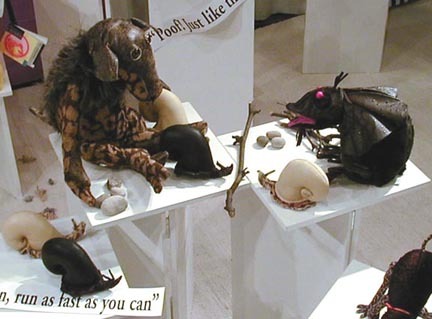 The Players are brand new creatures from Charleen. See their individual pages for their stories (Fred & Gwilym). The Players can be purchased as a set (Numbers one through thirteen sold as matched-number sets. Gwilym's decision). The set comes with Fred, Player One, and Gwilym, Player Two. They come as described on their individual pages but one two-sided playing board only. See Fred, Player One or Gwilym, Player Two for more specifics about each player. Other Comes in display box. The snails shown are slightly different than the snails that will come with the set.